Tunisia: Republican Party resigns from the government - The Maghreb Times ! The Tunisian Republican Party announced, Monday, that it is leaving the government of Youssef Chahed and accepting the resignation of Iyad Dahmani from its political body. The secretary-general of the party, Issam Chebbi, stated the reasons of the withdrawal to the impossibility of working within a government which is under pressure from an influential group in Nidaa Tounes. This decision is due to a number of reasons, including the government’s position in favour of the administrative reconciliation law, and the practice of Nidaa Tounes, which leads the coalition government, of what he described as pressures on Iyad Dahmani, the spokesman for the government and a member of the Tunisian Republican Party, when obliging him to choose between his membership in the party or his position in the government. On Saturday, Dahmani handed over his resignation from the Tunisian Republican Party without explaining the reasons, and the party announced it accepted the resignation. The recent period witnessed tension in the relations between the Tunisian Republican Party and the leaders of Nidaa Tounes in light of party’s opposition to the law of administrative reconciliation and its participation in protests that demanded the cancelling this law. It is noteworthy that the Tunisian Republican Party is represented in the Tunisian Assembly of the Representatives of the People with one parliamentary seat out of a total of 217 seats in the Assembly. The government of Chahed also includes a number of figures that are close to or supported by national organisations, the Tunisian General Labour Union (the largest trade union in the country) and the Tunisian Union of Agriculture and Fishery (Farmers Union), along with nine independent ministers and three independent Secretaries of State. At the end of the last month, the Tunisian presidency announced that President Beji Caid Essebsi had signed a reconciliation law with government officials. With that, he gave the sign that the controversial law has become into force. 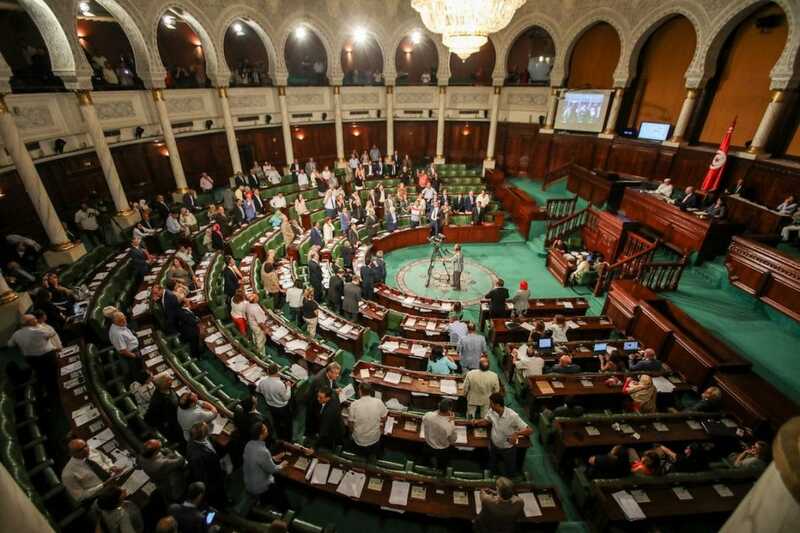 The reconciliation law was rejected by Tunisian opposition forces, which, in mid-September, appealed 35 MPs (out of a total of 217 MPs) to the Interim Commission of Monitoring the Constitutionality of Laws. However, the Commission has failed to appeal against the reconciliation law and referred it to the President of the Republic to be approved and published in the Official Journal of the Republic of Tunisia (JORT), or to be referred back to the parliament for reconsideration, as provided by the law.